1. Must be a Bachelor Degree Holder. 2. Must have an experience in Sales/Marketing. 3. Must possess a pleasing personality and professionalism. 4. Must be fluent in English but knowledge in Arabic language will be more advantageous. 5. Preferably with a valid UAE driving license. 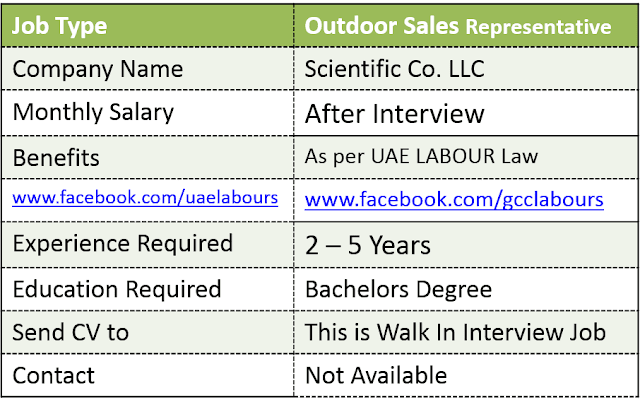 Salary: Salary is a subject to be discussed on the interview with the direct management of the company and will depend on mutual agreement as well as on experience in the same field. Note: Applicants Who Failed To Comply With The Requirements Mentioned Above Will Not Be Entertained. Please come in your best corporate attire. Interview Location: AL NASR PLAZA OFFICE 215, OUD METHA, DUBAI, UAE (Near Oud Metha Metro Station, Exit 1). Interview Details: Today Only 28th Dec 2016 (10:00 am – 03:00Pm). Contact: This is Walk In Interview Job, You have to reach above Address for face to face interview.